The Foxes are now through to the Quarter finals of the Champions League with a 2 Nil win over Spanish side Sevilla at the King Power Stadium, to whom they lost 2-1 in the first leg back in Spain. 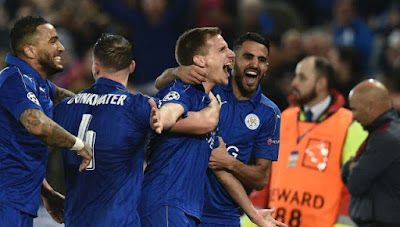 Wes Morgan and Marc Albrighton scored the two goals required to put them back on track in the Champions League with a 3-2 aggregate, as they continue to break New grounds in the competition. A change in the team since Craig Shakespeare took over has been notable, as the side has won all games under the new manager. The foxes took the lead in the first half as Wes Morgan pushed in Riyad Mahrez free kick despite been dominated in possession. The Game almost got leveled few minutes after the break by Sergio Escudero's long effort which went beyond the Foxes Number one but hit the cross bar before it could dip into goal. Leicester showed excellent defending which was backed up by counter-attacking, one of which gave Marc Albrighton the opportunity for a nice drive that had the Foxes go two goals ahead. The Game got sour for Sevilla in the 74th minute as they were reduced to 10 men due to a feud between Samir Nasri and Jamie Vardy, earning Nasri a second yellow. The best opportunity came for Sevilla, 10 minutes to the end as the Italian referee Daniele Orsato pointed to the penalty Spot, sparking some light for the visitors, but this opportunity was thrown away by Steven Nzonzi who struck a low shot which was easy enough for the keeper. The Foxes join Barcelona, Bayern Munich, Borussia Dortmund, Juventus and Real Madrid in Friday's quarter-final draw while tomorrow Manchester City go to Monaco and Atletico Madrid play Bayer Leverkusen to determine the final two sides in the last eight.